Raising TRICARE costs for retirees is the most effective way to curb rapidly increasing military health care expenses at the Defense Department, according to a new analysis from the Congressional Budget Office. Funding for military health care jumped by 130 percent between 2000 and 2012, thanks primarily to legislative efforts to expand coverage to cover all out-of-pocket costs for Medicare-eligible retirees and a dramatic increase in the number of active and former military personnel who enroll in the coverage. Of the 10 million individuals eligible to receive health care coverage through TRICARE, 8 million -- a majority of whom were retirees and their families -- elected to do so in 2012. Defense now pays $52 billion annually -- about 10 percent of its base budget -- toward health care. CBO looked at eliminating the TRICARE Prime option for working-age retirees as the department’s most cost-effective option. Prime, the most expensive coverage option for the Pentagon, is the most popular enrollment plan, with 5.2 million participants. The approach examined by CBO would allow retirees younger than 62 years old to participate in TRICARE Standard or Extra coverage after paying an annual enrollment fee. That plan would reduce TRICARE outlays by $85 billion over the next 10 years, though total savings to the federal government would be closer to $60 billion due to deferred costs to the Veterans Health Administration and the Federal Employees Health Benefits Program, as well as reduced tax revenues. Defense could find savings less dramatically by allowing retirees to keep their existing coverage options, but making them pay more for it, according to CBO. By increasing enrollment fees, copayments and deductibles for working-age retirees using TRICARE, Defense could save $24 billion over 10 years, though the net savings to the federal government would be $18 billion. A third option would require a fixed cost that Medicare-eligible retirees would have to pay out of pocket, after which point Medicare and TRICARE would combine to cover 100 percent of costs. CBO used an initial out-of-pocket annual cap of $3,025 in its analysis, which would reduce the federal deficit by $31 billion over the next 10 years. While CBO study did not factor in any changes in coverage to active-duty military personnel and their families -- all of whom receive Prime enrollment with no annual fee -- adjusting benefits to military retirees has proven politically difficult in recent weeks. The December bipartisan budget agreement found $6 billion in savings from reducing working-age military retirees’ pensions, which prompted an uproar from lawmakers in both parties. The omnibus spending agreement that Congress passed this week repealed some of those cuts, and legislators have vowed to roll back the rest of them. CBO also noted, however, only a “small fraction” of military personnel serve long enough -- 20 years -- to become eligible for TRICARE as retirees. The analysis also examined cost-saving measures such as better management of chronic diseases and more effective administration, but CBO concluded it offered only a fraction of the savings that increasing TRICARE costs would yield. 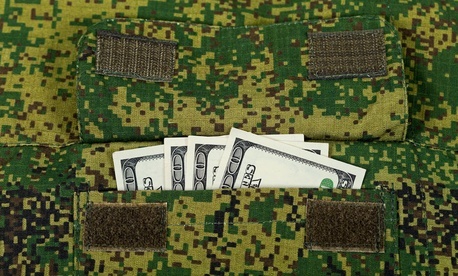 As required by the 2013 National Defense Authorization Act, the Pentagon currently is reviewing military pay and benefits -- including health care programs -- with its Military Compensation and Retirement Modernization Commission, which is scheduled to issue a report in early 2015. Defense Secretary Chuck Hagel has said the status quo cannot continue. “We will work with Congress to bring the rate of growth of our compensation and benefits programs in line with budget limitations and fiscal realities,” Hagel said in December, in response to the budget deal. President Obama also proposed TRICARE fee hikes targeting military retirees in his fiscal 2014 budget.